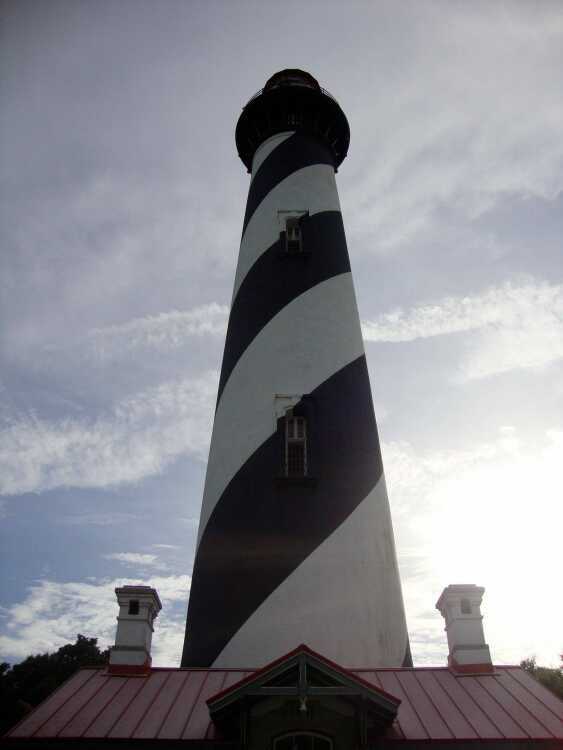 Lighthouse in St. Augustine that we climbed as a family in 2013. In my mind today I'm thinking about yokes and lighthouses. Crazy combination, right? When I opened my readings this morning the first line was "Take my yoke upon your shoulders." Students do you know what a yoke is? No, not the yellow center of an egg! That's a yolk. Let's look at the great western migration. The oxen had yokes on them to pull the covered wagons westward. Was it light? Oh, no just the opposite. It was there to guide the beast of burden to the dream of land and a new life. So when someone asks you to take a yoke, you may respond, "No thank you! I have enough to carry as it is. Sickness, addictions, bills, and feeding my family are enough right now. Thanks anyway!" Reading more closely, why would God ask us to take His yoke? He's supposed to be on our side. Just like the beast of burden(I'm trying hard not to sing a Stones song here) this yoke was created to guide us not to free land but to the promised land, heaven. The yoke gives us morals and rules to live by that create peace and harmony. It becomes bothersome when we face tough choices like indulging in our materialistic nature instead of helping those struggling around us. What about when we gossip or talk condescendingly about the addicted or poor? The yoke of Christ burns a ring on our necks but we need it to do that, don't we? Let's connect the dots. One of my nieces loves lighthouses. They are a tower of safety to ships approaching rocky shores. The new technology has made most of them obsolete. They flood the shores with light. They are amazing, stoic, and beautiful. Now what do lighthouses and yokes have in common? If you wear your yoke well abiding to it's rules then you my students become lighthouses for those approaching rocky shores. You shine a light that is different from what they are exposed to in the dark world in which we live. It beckons them to a safer and brighter more moral path. Each yoke-wearing choice you make can make a huge difference in someone's life. Believe it. It really does. Today embrace your yoke. When you want to say something cruel or rude, stop yourself. Say encouraging words even when you feel like cussing! Fuel up that lighthouse. Someone's journey to love and peace is dependent on it! "You will finally have dignity when you realize that you are not on the path, but have become the path for others."